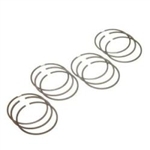 This is a replacement standard piston ring set for JE pistons. These will fit all of the standard JE pistons that we sell. These are sold as a complete set for the full engine. Please note your piston part number in order comments section to ensure accuracy. This is a replacement standard piston ring set for JE pistons. These will fit all of the standard JE pistons that we sell. These are sold as a complete set for the full engine. Please note your piston part number in order comments section to ensure accuracy.